Case IH RB5 and RB4 Series round balers consistently build dense round bales, even in varying crop and field conditions. Choose from five models, known for wide pickups, durable belts and rolls, and the ability to custom build round bales. 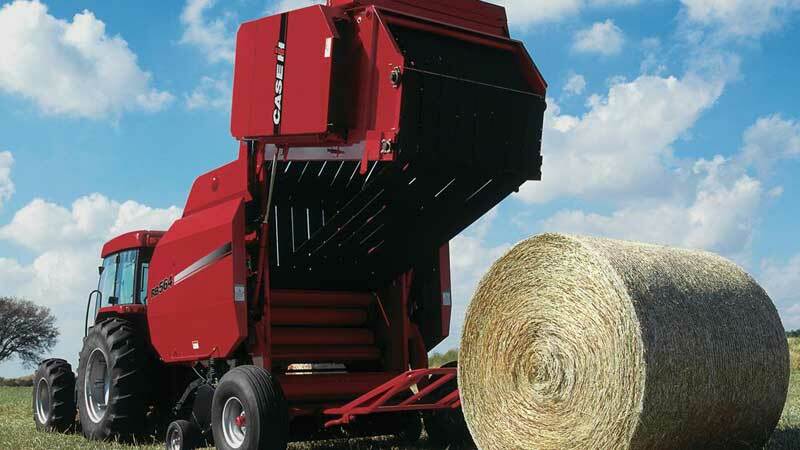 RB 4 Series round baler pickups are substantially wider than the bale chamber which allows them to pick up the widest windrows and pack more crop into the sides of the chamber for firm bales. More tines grab more hay (72 tines on the RB444 and the RB455A). The low profile design allows the pickup to float over ground contours. The pickup’s forward location allows you to view windrows feeding and crop flowing evenly into the bale chamber long, large diameter augers on wide pickups ensure smooth crop flow and pickups are protected from overload with a slip or ratchet clutch. The new five bar pick up combined with a roller wind guard provides a clean sweep of crop and uninterrupted feeding of material into the baler, and the new overshot feeder provides smooth and consistent crop flow from the pick up into the bale chamber resulting in higher capacity. Large pick up width allows you to pick up wider, fuller windrows to maximize your productivity in every pass while the low-profile design lets the pickup float over ground contours, gently gathering crop and saving nutrient packed leaves.